Red Sofa Open House, Jan. 11, 2015. Photo by Sonia Petruse. This past weekend I had the pleasure of hosting two inspiring Red Sofa events: Friday was our first reading of the new year featuring three incredible poets & writers, and Sunday was the workshop open house. The energy at both events was infectious and nourishing for me and for those who were present. 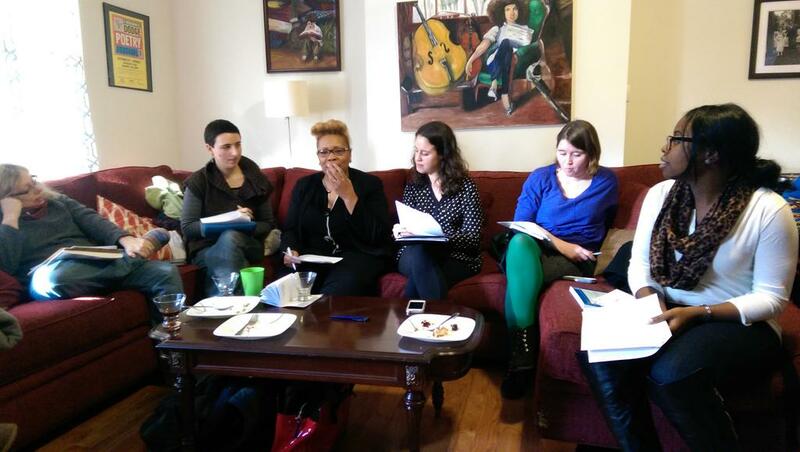 Now is the time to make a commitment to your poetry writing practice and join the winter/spring workshop series. As always, the workshop includes homemade vegetarian food, wine, & drinks, and a supportive community in which to grow in your practice. Workshops include optional writing exercises, close readings of poems, and critiques of works in progress, in addition to an optional one-on-one conference with me. The workshop will run for 10 weeks on Sundays (1:00–3:30pm) starting Feb. 1st. The cost for the series is $400. Registration deadline is January 28th. Special early bird discount of $20 off if you register by January 25th. If you have any questions, please email me at redsofasalon@gmail.com. I’m saving you a seat at the Red Sofa! This entry was posted on Tuesday, January 13th, 2015 at 3:54 pm	and is filed under creative process, literary, Philadelphia, Philly, Poetry, poetry reading, poetry workshop, writing, writing process. You can follow any comments to this entry through the RSS 2.0 feed. You can leave a comment, or trackback from your own site.